Straight from sunny Socal and from the lens of pinup photographer Mitzi, welcome Erica Vaughn our October Pinup of the month. Erica’s revealing a little of what she likes in an interview along with her sweet smile and devilishly red hair! The classic styled 1923 T-bucket is owned by James Dean. How did you get into pinup Modeling? I was watching alot of Charlie Chaplin silent films. I am a huge fan of Charlie Chaplin! He’s directed alot of amazing actresses like Lillian Gish, Clara Bow, and many more. By watching those wonderful women I just fell in love with the 1930’s and 1940s… I’ve looked up to many of these inspiring women throughout there career; They’re very funny, energetic, and outrageously beautiful in all their pictures. After being a fan for many years I wanted to pursue pinup/retro/fetish modeling… so I did… and I LOVE IT!!! What is your favorite car show to attend and why? My favorite car show of coarse is the Viva Las Vegas Weekender! 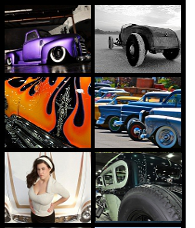 I love this car show because there are so many events happening all the time: the fashion show, car show, rockabilly bands, burlesque show, pin up contest, etc… Viva is also in the best place ever LAS VEGAS!!!! What makes a hot rod “cool” to you? For me a cool car is a custom exterior or interior that carries a theme or is completely different… cars that will catch my eye and also have to have alot of power! My fave car is a 1935 Buick hearse with a big block engine… super hot! Old school metal! I would like to thanks my parents for introducing me at an early age to rock… I also love a lot of underground and old school punk! Guys: Sweet and romantic or the bad boy? My goal in life is to complete my register nursing license and continue with school for my nurse practitioner license specializing in pediatrics. I haven’t been there yet but I am surely working on it but I do want to go visit Ireland and meet new people and learn allot from their culture! Cruisin’ the strip or roaring down the 1/4 mile? -ROARING down the 1/4 mile! Most attractive quality in a man? My dream date’s a guy who likes to have fun, who is energetic, who makes me laugh, who know hows to rock, and also can hold his liquor. For pinups lasting the whole year, check out Mitzi’s 2011 Hot Rod Pinup Calendar. what is more beautiful, the car or the lady ??? ?